23b Truly, truly, I say to you, if you ask the Father for anything in My name, He will give it to you. 24 "Until now you have asked for nothing in My name; ask and you will receive, so that your joy may be made full. 25 "These things I have spoken to you in figurative language; an hour is coming when I will no longer speak to you in figurative language, but will tell you plainly of the Father. 26 "In that day you will ask in My name, and I do not say to you that I will request of the Father on your behalf; 27 for the Father Himself loves you, because you have loved Me and have believed that I came forth from the Father. 28 "I came forth from the Father and have come into the world; I am leaving the world again and going to the Father." In this passage Jesus reveals the secret of what it will say to pray in His name, or to own His name - the name the Father has given us for salvation and to be adopted as sons, - the name that has the meaning: "The LORDs salvation." As it through the preaching starts to dawn for you - for your heart - that God really has given you this name, this person, Jesus, then faith will also come to you. It is to start believing, not that you have taken the decision that you now want to become a Christian, now you want to believe in Jesus, take a stand for Him etc., but that the teaching of the Word of God works confidence to God’s Word in your heart, whereas the fruit will be that you take your refuge in Jesus. This is a gift from God A to Z, disclosed to you by the teaching of the Word. If we have understood this, then we will also understand how important it is what is being preached. And we know that faith comes by hearing – and then again; not only anything, but the Word of Christ (Rom. 10:17). God sais in His Word that He has given Jesus Christ in your place, as a perfect salvation for you. - There is only one condition, one demand – yes, it is a demand and a condition, but what is it? That you are a human being! That must have been hard to fulfill? By the time you realize this – that it is already given to you in Him, you will also fully take part in it. And then you see that the Word speaks about incredible things. You shall walk freely in and out to the Father, as a child in his father’s house, because Jesus always lives at the throne of God, as the One who is wounded for our transgressions. It is to believe in the name of Jesus – it is to pray in His name – it is to refer to what the true Word of God teaches us about what happened by Him here on earth, and what is now being revealed in heaven. Jesus counts in my place! Jesus intercedes in prayer for you, but never look at it like Jesus always has to ask for forgiveness for you over and over again. As if God had to be reconciled again and again, every day over again. No, the victory of reconciliation was made once and for all, by the sacrifice of Jesus Christ on the wooden cross. 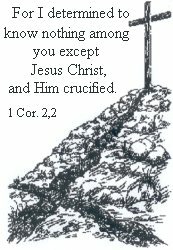 On the cross of Golgotha, Jesus was interceding for you, once and for all! That is what God sees. The Word does not tell us that God shall be reconciled, but that He is! What He Himself brought forth and laid on the heavenly altar, was made by the blood of the Lamb. When God’s eyes fell on it, He no longer saw sin in you. There is no need to add anything to what is already there. Those who do that brings something of their own – unfortunately most people who do that, wants to go to heaven. By that they despise reality, the sacrifice that is already there. That which has God’s own mark by the resurrection of Jesus Christ from the dead, is completely sufficient. Sufficient for what? To reconcile God and your salvation. Jesus sais something peculiar here, if you think about the common Christian perception: “And I do not say to you that I will request of the Father on your behalf” (v.26b). “And, not?” No, because as we already mentioned, He has already done that. “No,” He says, “For the Father Himself loves you, because you have loved Me and have believed that I came forth from the Father.” (v.27). Therefore by your refuge in Jesus – “My salvation I do not know, without you the Lamb of God, only in your righteousness is all my shame hidden” - you have entered into a completely new relationship with the Father Himself. Because of His sacrifice and His name, you can freely walk in and out to the Father like you were Jesus Himself. And you can pray to Him about anything, and you shall receive it. Not anything that your old nature wants or desires, but anything you need. And above all this, to know the Father. There is no other richer life for a human being on earth than to know the Father. There are few who does, also those who are called by His name. But listen: He is the God of all comfort, He is love, He is the God of mercy, He is the source of life and this is not all. Be aware that this is not gifts that He gives, it is what He is. Should not that be enough? If you want to know the Father, you have to learn to know the Son, because it is in Him He is revealed. He is the Way. It is truly in His hand, as He says: “- and anyone to whom the Son wills to reveal Him. (Matthew 11:27). Maybe it is time to start crying out to Him for light - the light of salvation. Maybe it is time to start seeking the Kingdom of God and His righteousness first, above all the rubbish in this world, which you will have to leave one day. Think how naked and poor to enter into eternity with an unsaved soul! We cannot grasp how tragic and unnecessary it is - as you heard; it is enough that you are just a human being! Jesus sais a couple of things we need to take notice of: “So take care how you listen.”(Luke 8:18). And : “Remember Lot's wife!” (Luke 17:32). She could not stand to leave what she had in this world, and she was left standing as a pillar of salt. Listen to what He - our good God says: “Ask and you will receive, so that your joy may be made full.” (v.24b). Nothing in this world can give perfect joy. Only Jesus can give that. Because you know the only true God, exactly by whom He sent out, Jesus Christ. He was sent to earth so that we could find the way to God and only therefore He is still among us. If this has not succeeded in your life, nothing of what you already have succeeded in will matter. You are therefore to be counted as a heathen and not a Christian. That’s how decisive it is. Do you know Jesus, Jesus in the Word of God? Just listen: “For the Father Himself loves you, because you have loved Me and have believed that I came forth from the Father” (v.27). The road up is free, remember that whenever you pray.